The “OGs” of Logan Circle Restaurateurs are Farmers Too? Farmers at EatWell Natural Farm harvest produce, then deliver to the EatWell restaurants. They also help with composting efforts with each restaurant. Sourcing local and seasonal food continues to be a growing trend across restaurants globally. While we’d love to say it is being driven by pure altruism on the part of food businesses, the ones behind the wheel are actually consumers. But if you don’t want to have to wonder about the source, consider a restaurant that not only works with local farms—but owns one. In the DC area, one of the original gangsters, if you will, of local sourcing is the EatWell Restaurant Group, whose eateries include Logan Tavern, Commissary, The Bird, Grillfish and the Pig. In 2003, the group decided to purchase and operate its own 13-acre farm in La Plata, MD, to source for the family of restaurants. This fall they will launch their newest restaurant, The Charles Public House & Farm Table, also in La Plata, which will bring their farm-based inspiration to the forefront. In the DMV, sourcing locally plays out in many ways. At various FRESHFARM markets like Dupont Circle or Penn Quarter you can routinely catch Executive Chef Jeremiah Langhorne from the Dabney or Chef Michael Costa of Zaytinya walking around with their teams purchasing crate after crate of local produce. Chef Amy Brandwein formed a partnership with DC Urban Greens in Southeast DC. She supports their efforts to provide affordable fresh produce in a food dessert by purchasing products for her menu and even volunteering to work the farm with her team. Chef Rob Weiland of the Garrison installed and pulls from multiple small urban chef gardens near his restaurant as a means to get local produce. We took a visit to the EatWell Natural Farm and chatted with the team—the farmers, the chefs, the manager—about what it’s really like to source from and grow for a restaurant group-sized farm. Farm-to-table dining keeps EatWell’s restaurants’ menus flexible and innovative. Edible DC: How do you run the farm? Keith McNeal: We currently operate the farm with one full-time farm manager (that’s me), one full-time crew member and two to three part-time farm crew and delivery members as the season gets increasingly busy. We hire local folks who have an interest in small-scale, sustainable agriculture. It does help to hire those who have an interest and understanding of farming, as well as those who have experience in production-based agriculture focused on the culinary side of things. EDC: Does the produce only go to your restaurants? KM: Currently all our produce goes to our restaurants. In the future, we may sell to our local community, but now it is very important to EatWell DC as a company to ensure we are getting as much of our produce from our farm as we can. We have just over an acre under cultivation. Our goal would be to deliver to our restaurants up to three times per week and to source up to 60 percent of the produce that can be regionally grown directly from EatWell Natural Farm. EDC: Where do you get produce that doesn’t come from the farm? KM: We partner with local farmers in our immediate area. At the new The Charles Public House & Farm Table, we will have a perfect opportunity; our menu will reflect the great work our local farmers and food systems producers do. EDC: What’s coming from the farm this fall? KM: On the farm, we are growing vegetables that can be used by all of our chefs, in all of our restaurants. In the fall, we use season-extension techniques to continue to grow a wide variety of baby lettuces, root vegetables and cold-hardy crops to keep things as close to year-round as we can. This year, we are growing some new squash varieties: Blue Hubbard and Delicata. We are introducing Brussels sprouts to our crop list. Farm-pasture-raised hens are here with excellent eggs that usually go to The Bird. We would like to expand our egg production to get more into the other restaurants. We also focus on perennial crops: sunchokes, rhubarb, asparagus and lesser-known baby greens varieties. 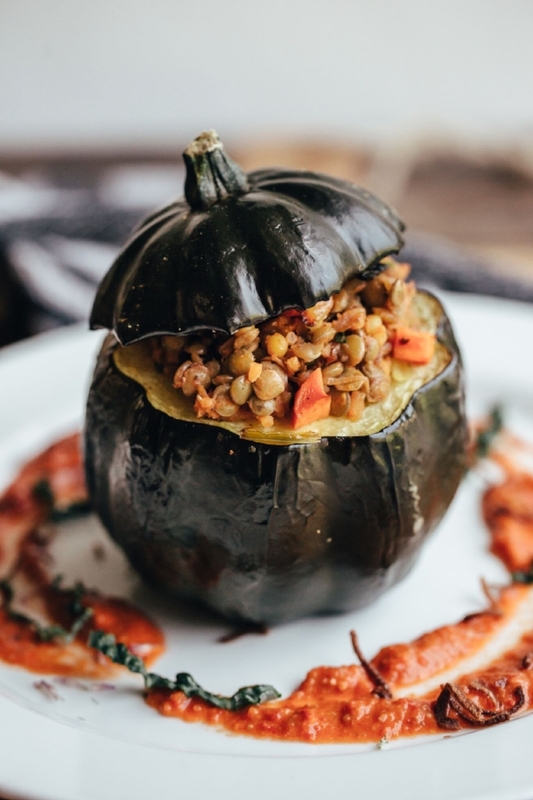 Utilizing local farm produce often results in seasonal dishes, such as this autumn-inspired stuffed gourd. We asked the chefs of the EatWell restaurants how they work with their weekly deliveries from the farm. EDC: How do you weave the EatWell Farm produce into the menu? Isaiah Ruffin, head chef, The Bird: I base our menu on what is available, so when the farm manager lets us know what he has or what will be coming, the menu gets developed around it. Madison Han, head chef, Commissary: The creativity of incorporating produce from the farm is like a quick-fire mystery basket challenge. I usually use fresh produce in daily specials or add to items that are already on my menu. EDC: What are the challenges and benefits? Shabier Bahramy, head chef, The Pig: When you get 20 pounds of farm radishes, you have to think on the fly and come up with creative ways to weave them into the menu and specials. Our farm is 100 percent organic with no pesticides, preservatives or additives. The shelf life isn’t as long as commodity produce, so it’s at its peak the moment it comes through our doors. It forces us to think outside the box and reflect a hyper-seasonal menu. Chef Will Crutchley works on developing seasonal menus, planning ahead for fall farm produce. Pictured here is a tandoori chicken salad with butternut squash, EatWell Natural Farm greens and apples. EDC: How do you think the farm helps brand your restaurants, if at all? Heidi Minora: Sourcing locally can mean anything—from a farm way outside the city, hours away to one in a different state. The EatWell Natural Farm is literally one hour outside the city. This sets us apart from any other restaurant in DC. Yes, we are serving a burger, but the bread came from a local bakery, the lettuce and tomato came from our farm and the beef was grassfed from a local butcher. This is a product that our staff can be proud to serve. And if your staff is proud of the company they work for, they will pass that along to their guests. As business owners, we feel very strongly that we have a responsibility to not just take from this earth but also give back to it. We are an eco-friendly restaurant group that composts in house. We use only biodegradable products in our restaurants, do not use plastic bags and have both energy-efficient and water-conservation efforts in our restaurants. EDC: How do your guests react to knowing you have a farm and grow your own produce? HM: Parents especially appreciate any restaurant that’s going to make natural foods tasty and approachable for their children. We offer volunteer days at our farm, which are excellent ways for parents and children to work on a farm and make lunch together. Folks are always eager to know more and we love that we can give them that opportunity.